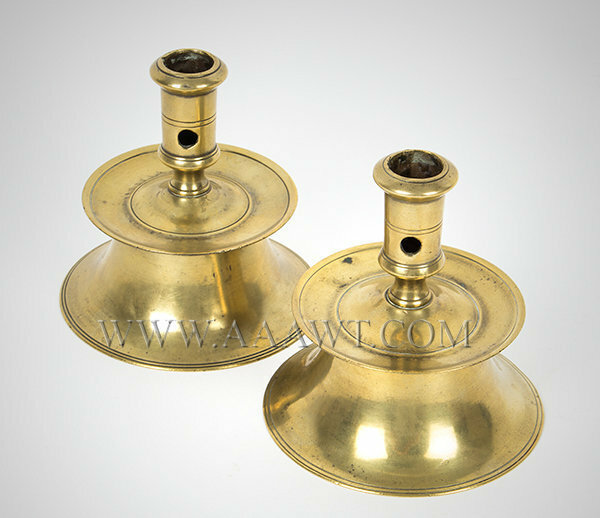 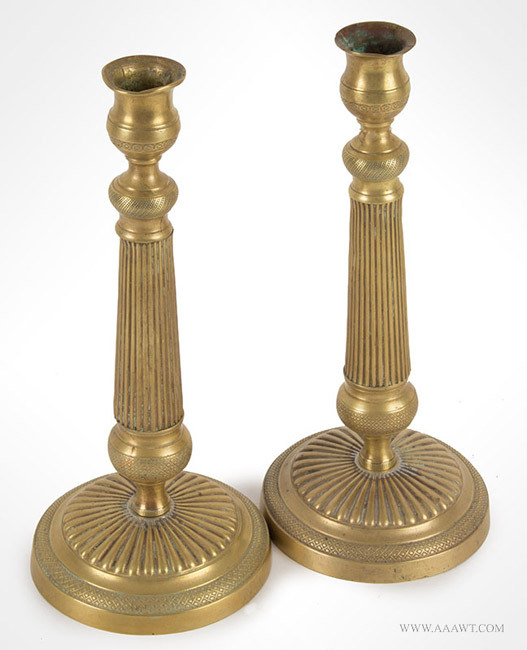 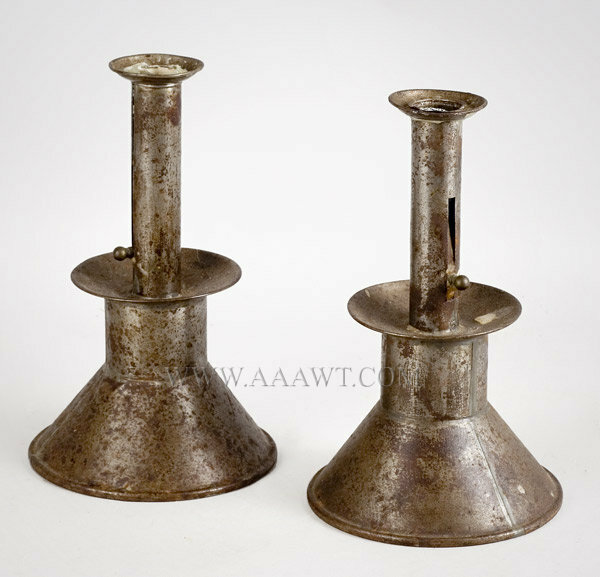 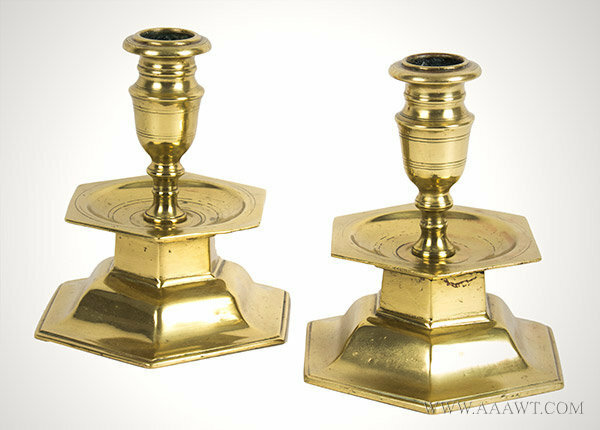 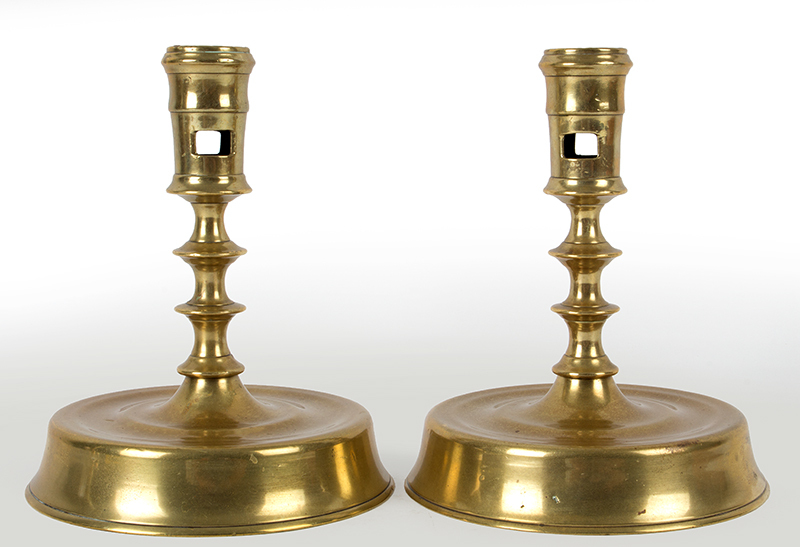 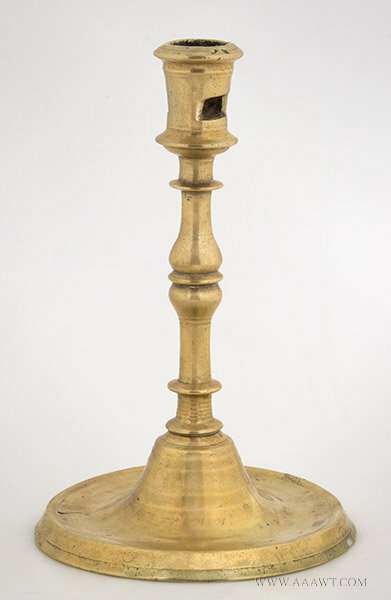 A pair of sockets and grease pans centering a small urn finial within the larger, yet conforming nozzle of the candlestick raised on a low-dome circular base. 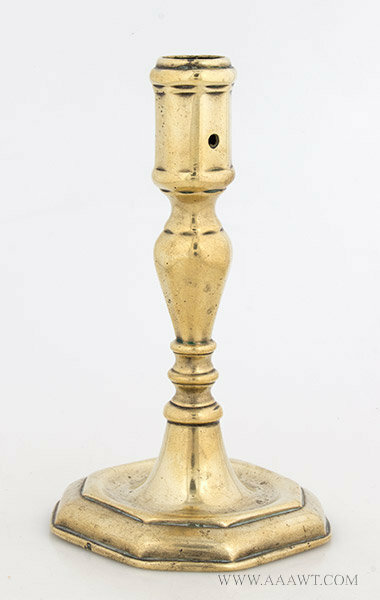 The sockets, finial and shaft are joined by threaded bolts. 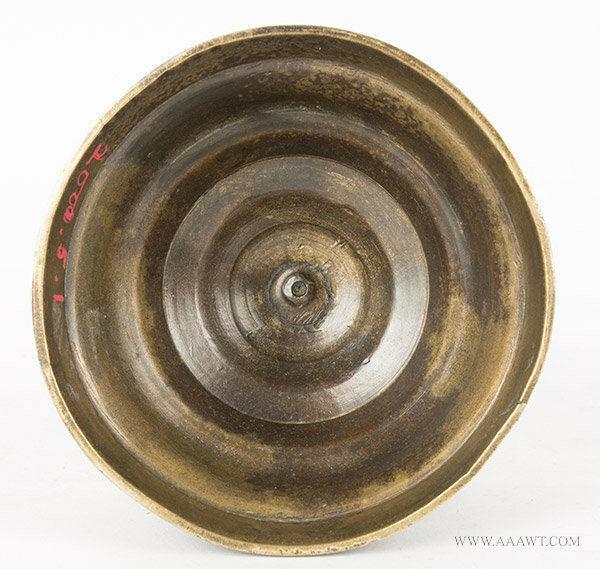 Underside of base was lathe-turned. 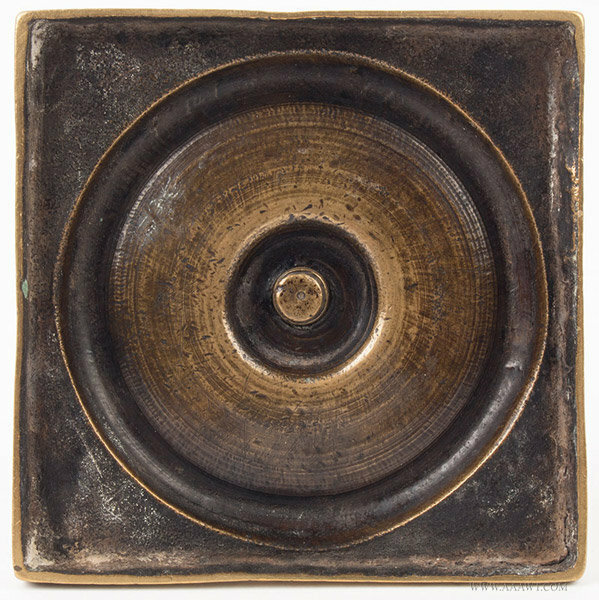 (Height: 8.5"; drip pan-to-drip pan with: 8.25"
Unmarked, likely Lyman Fenton & Co.
See Barrett’s Bennington Pottery and Porcelain, p. 135, plate 198. 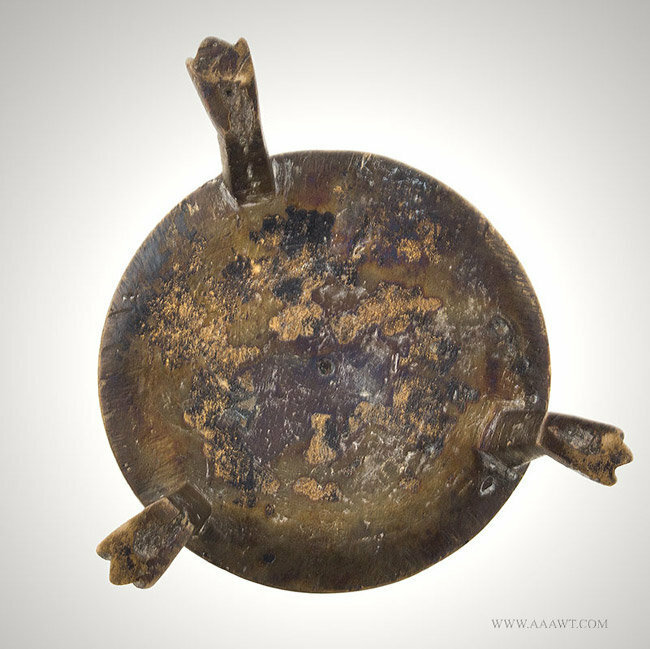 This stick is 10 3/8-inches in height and was excavated; probably lost soon after it was made based on crispness. 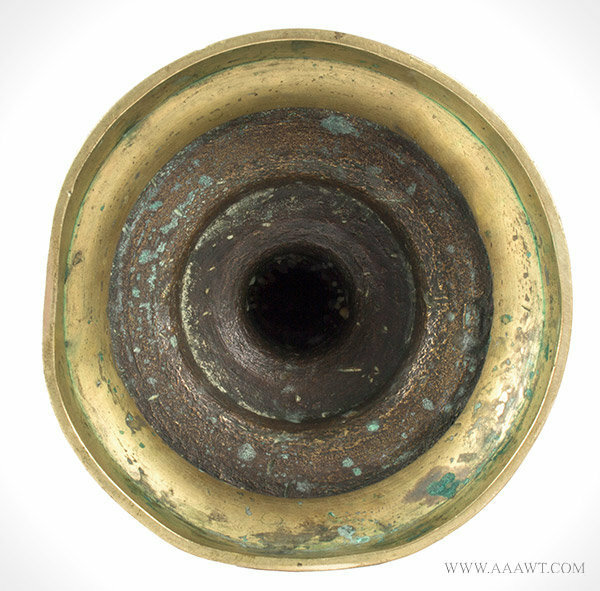 Notice the tapering between each discoid; aperture was finished by a competent tradesman. 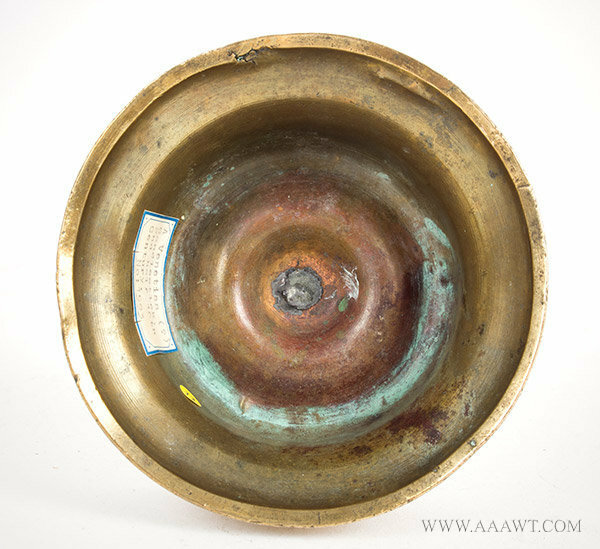 Mint condition except for losses to drip-pan. 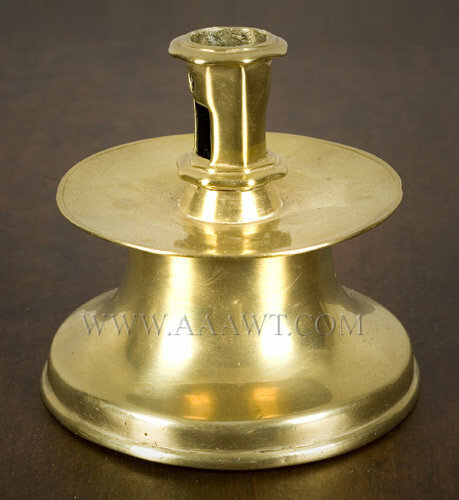 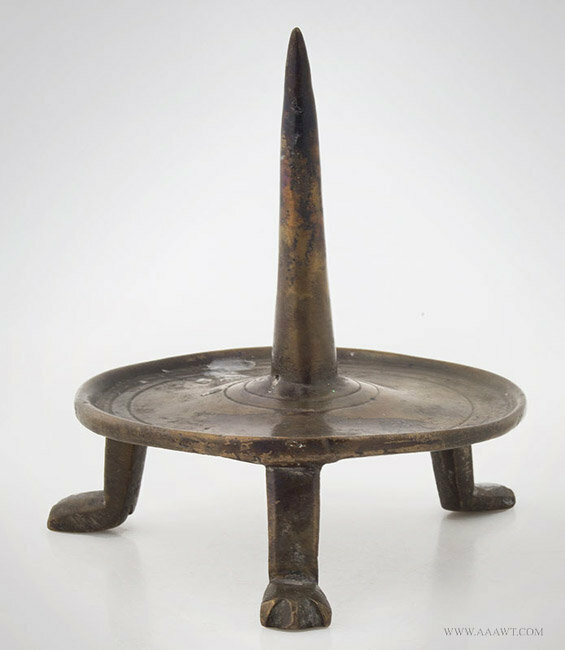 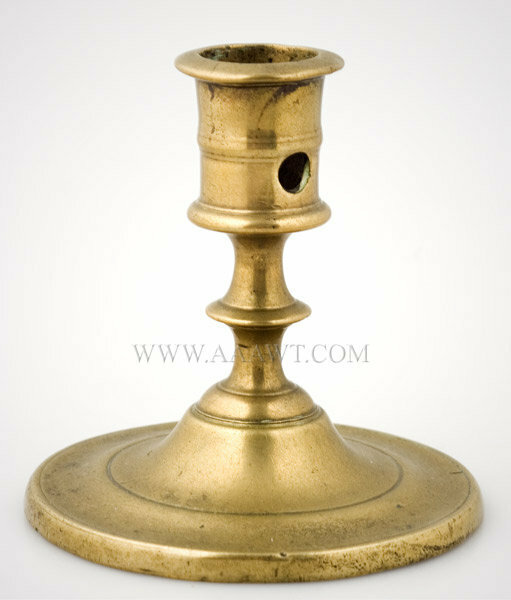 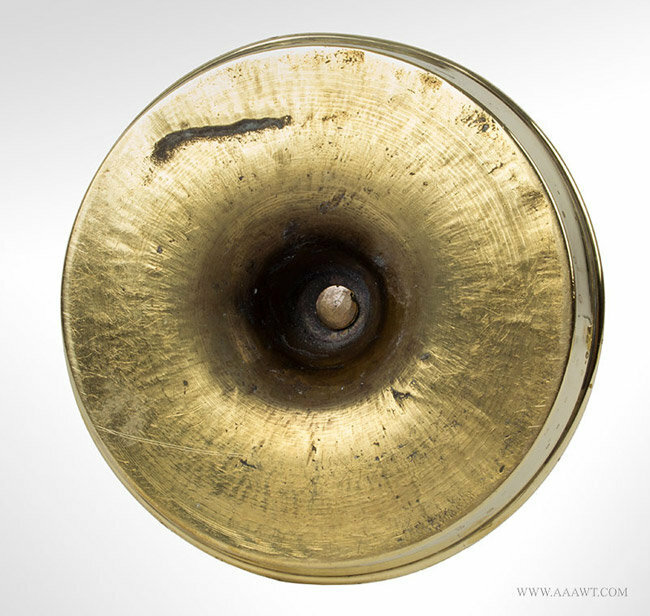 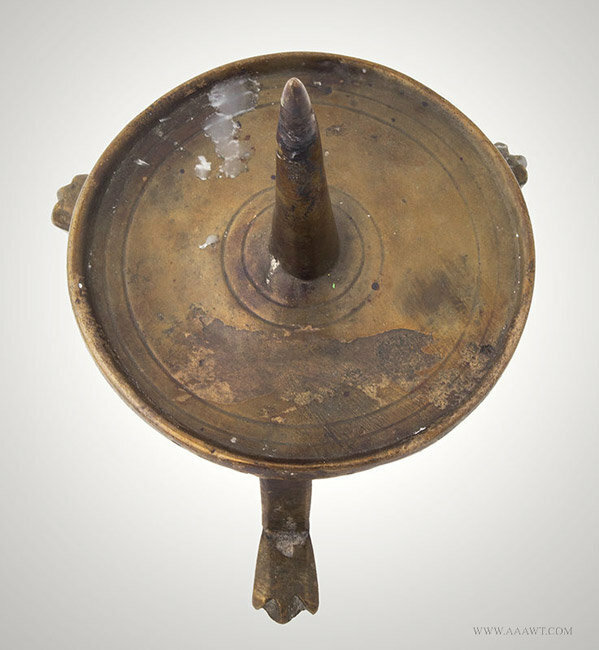 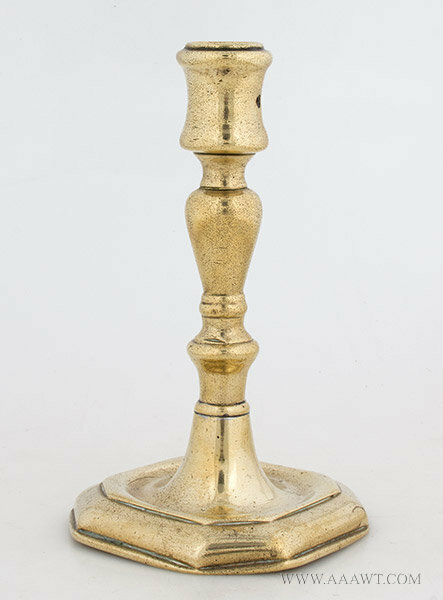 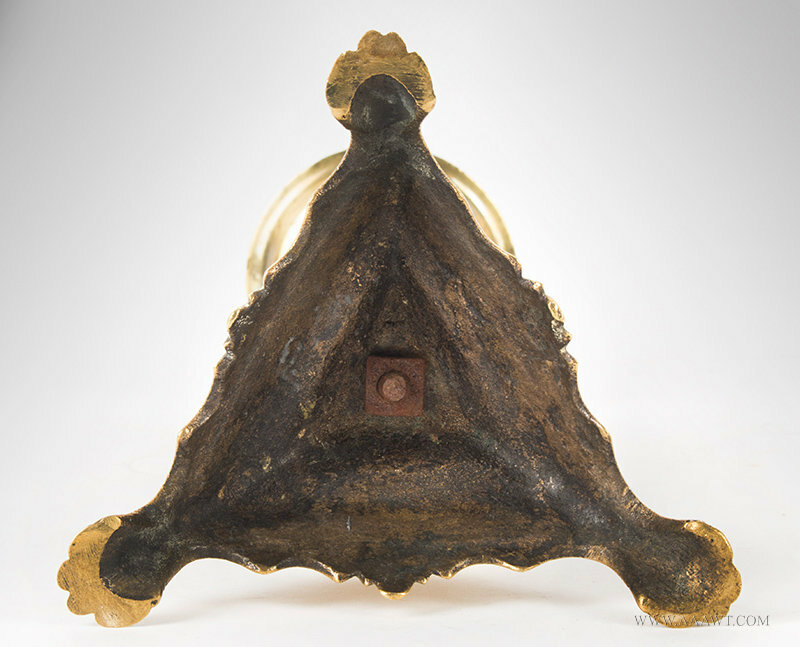 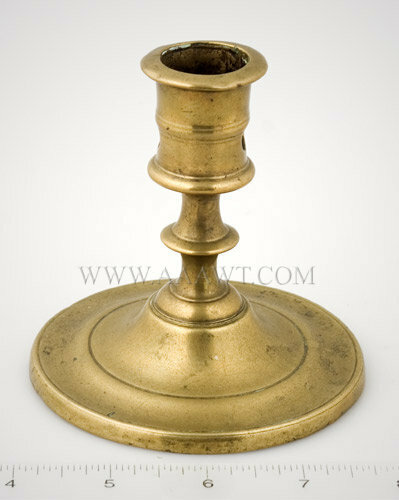 Franco-Flemish base metal candlestick on a typical low skirt shallow circular base; featured is a robust socket having two small rectangular ejection apertures. 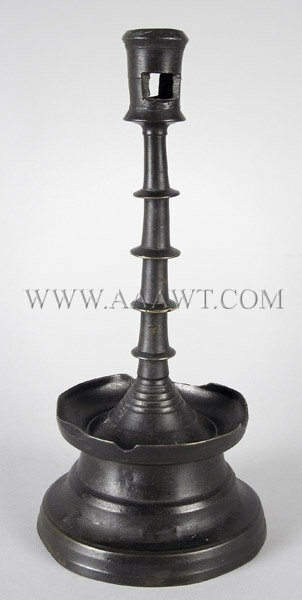 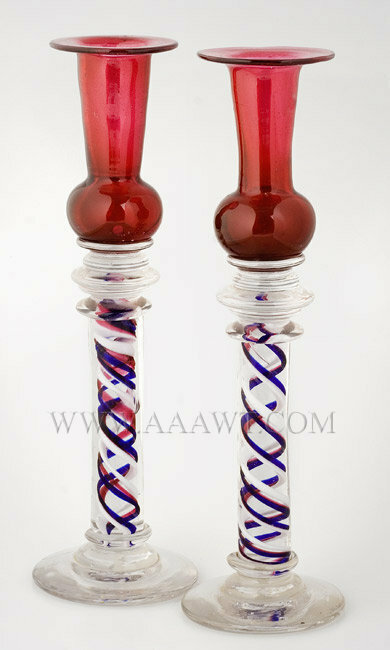 Made in two cast and turned parts, the shaft joins at a central raised ribbed cone of base. 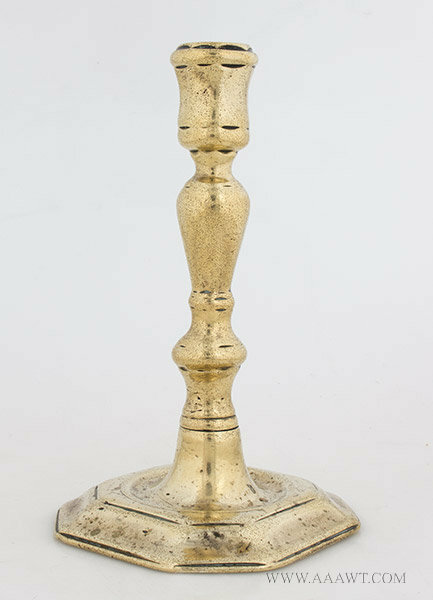 Northwest Europe; probably made in France or the Low Countries. 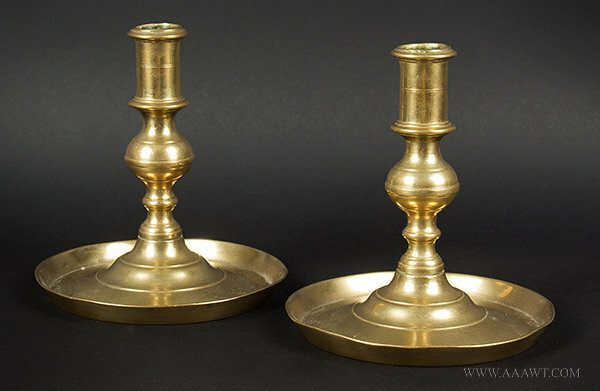 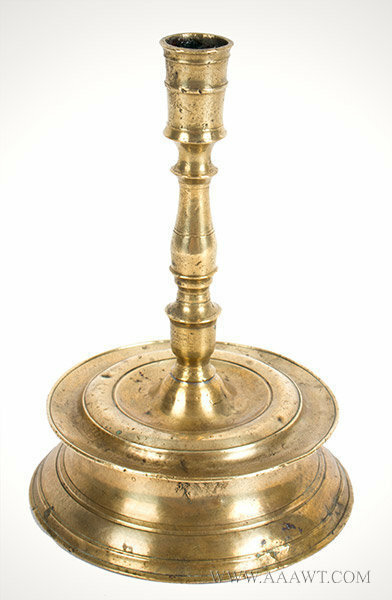 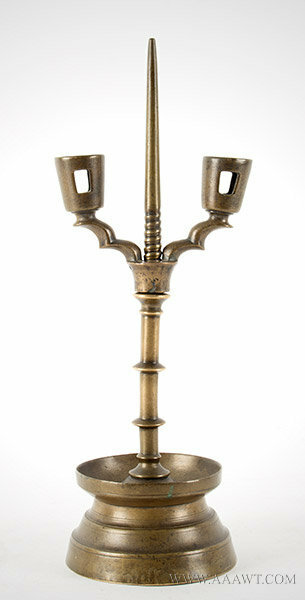 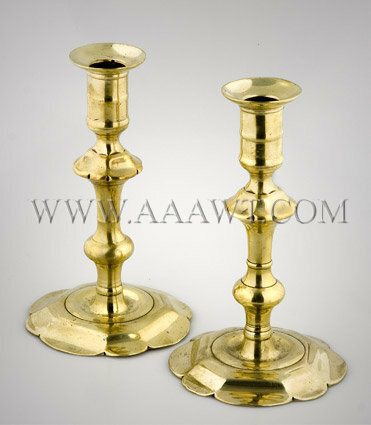 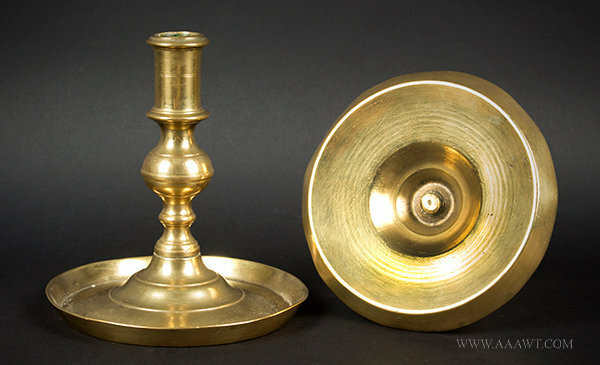 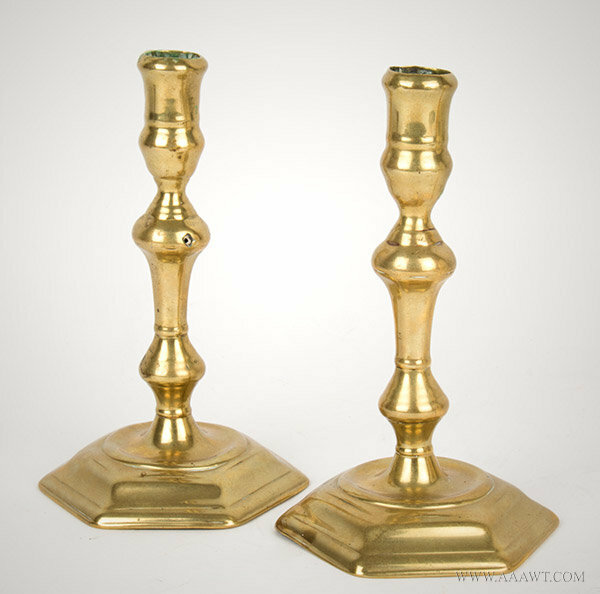 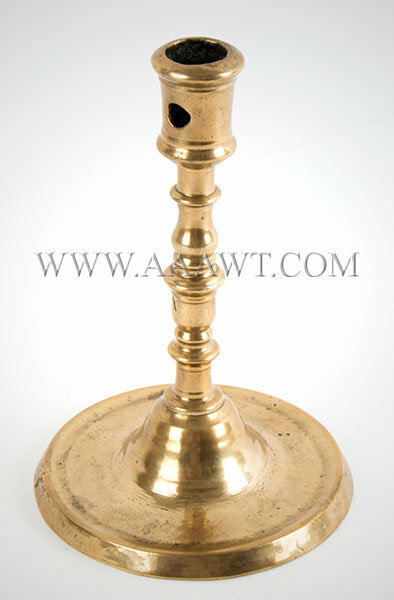 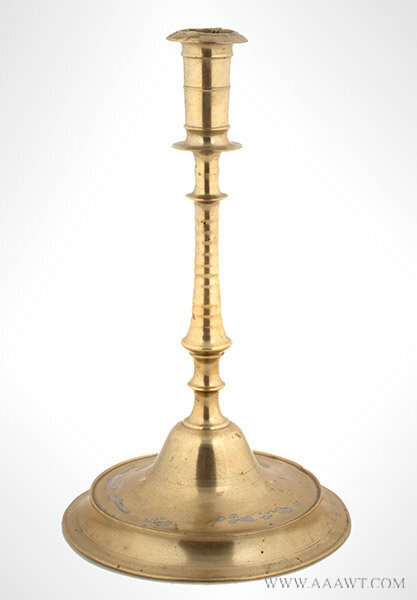 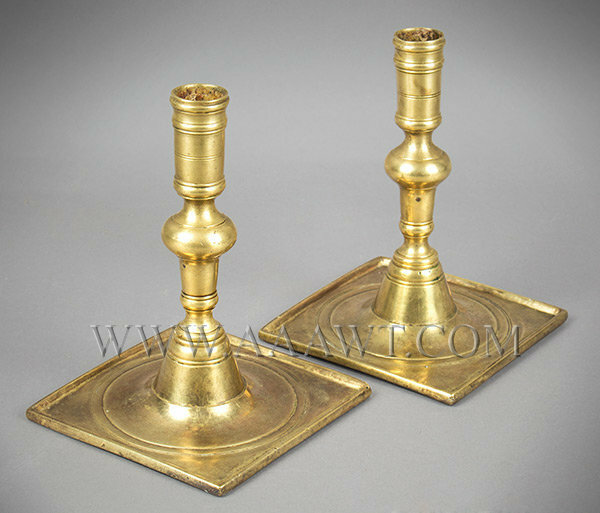 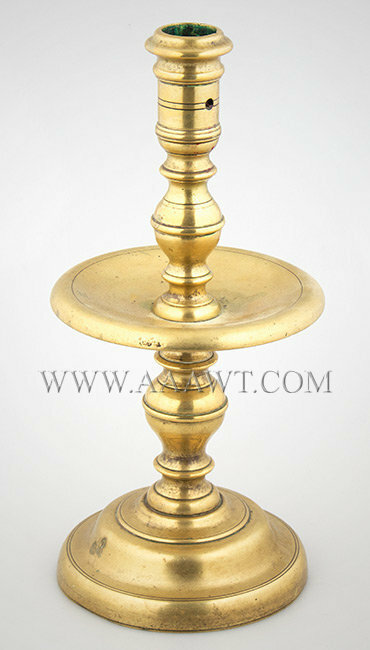 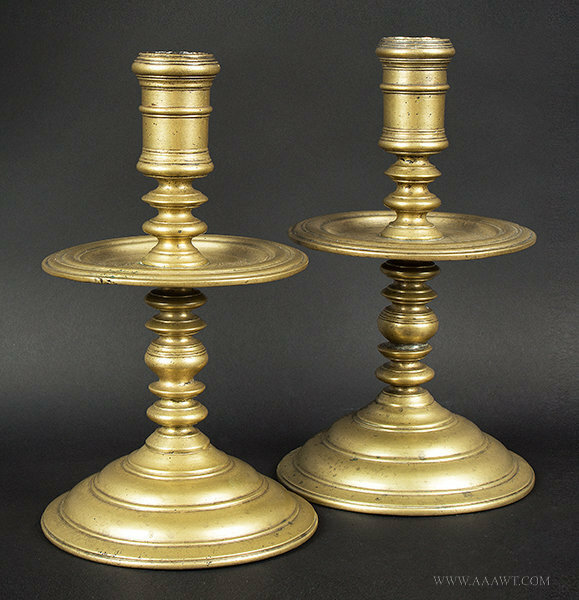 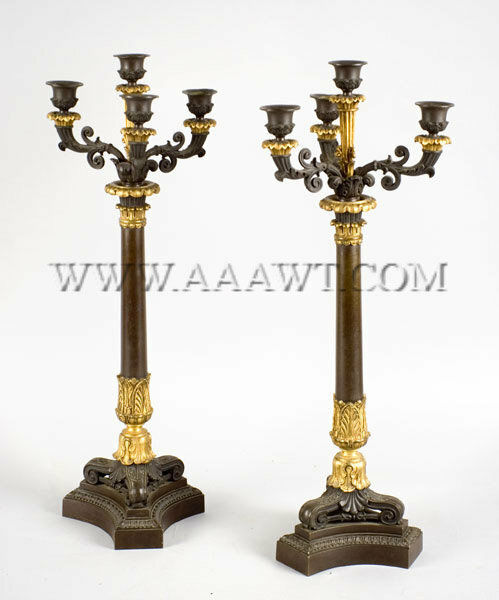 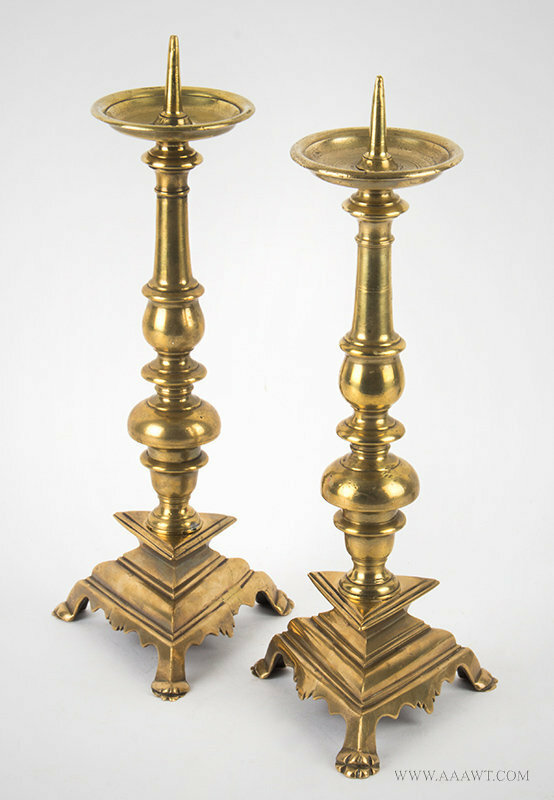 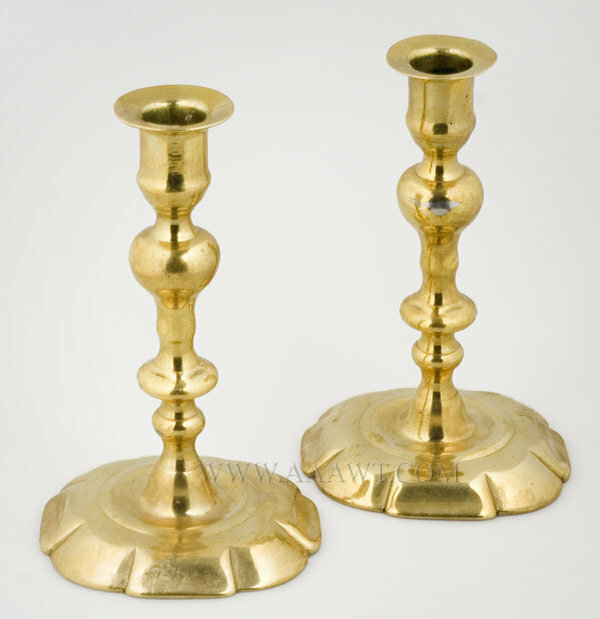 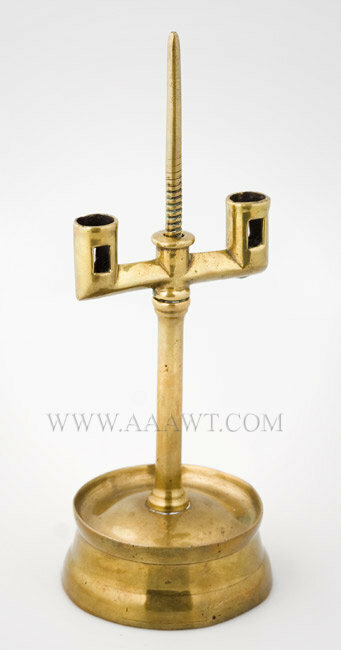 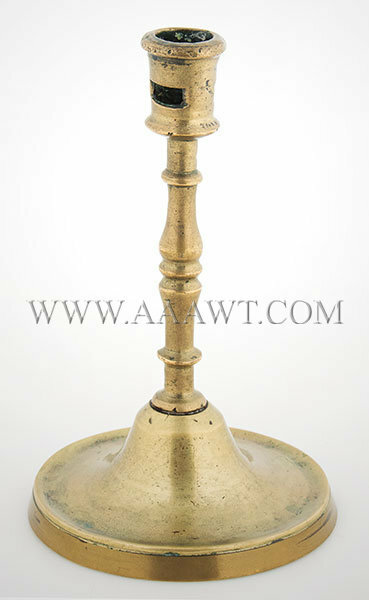 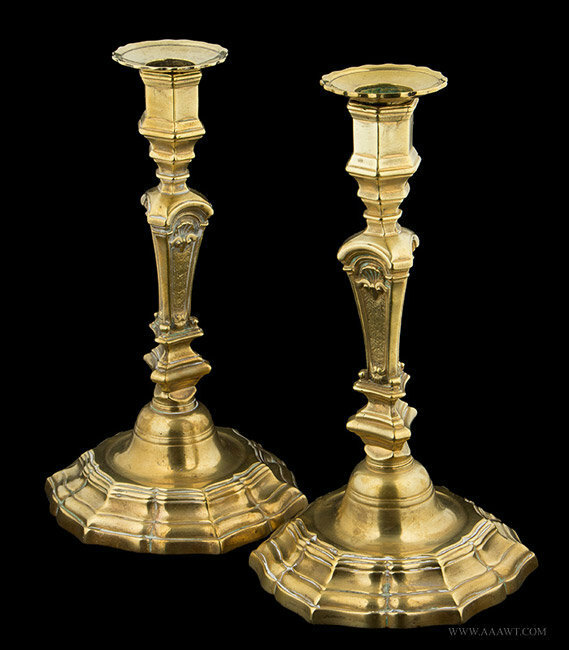 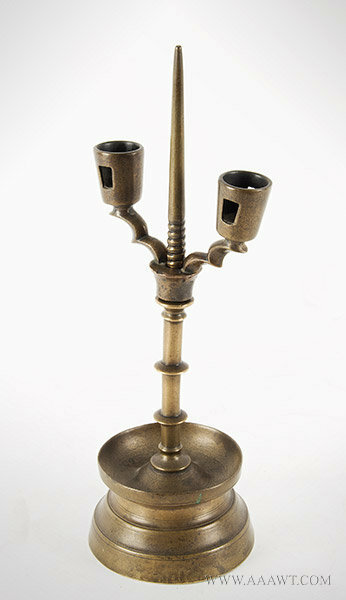 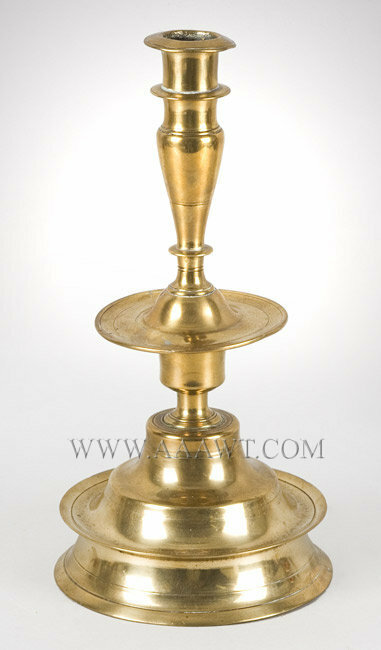 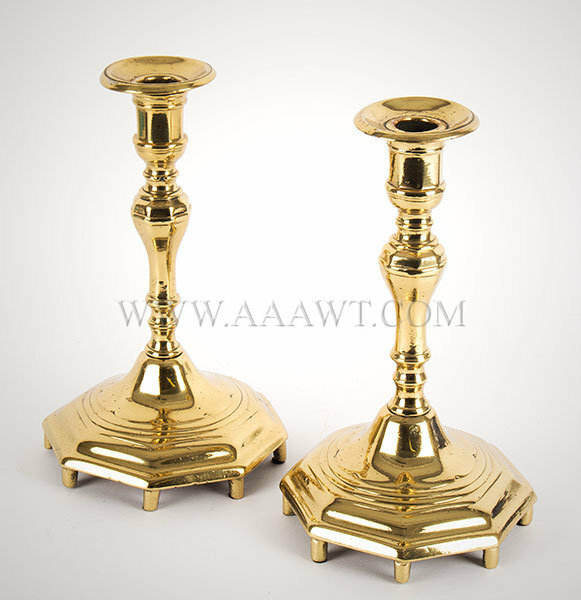 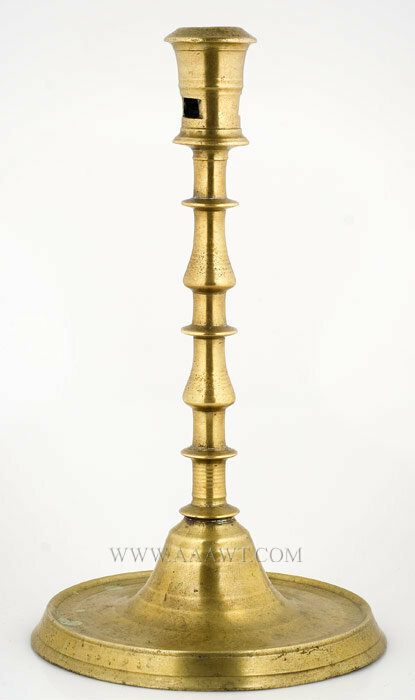 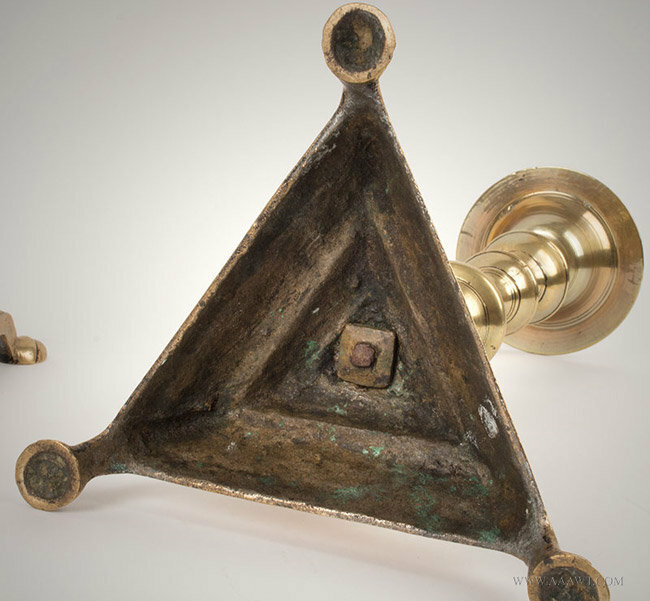 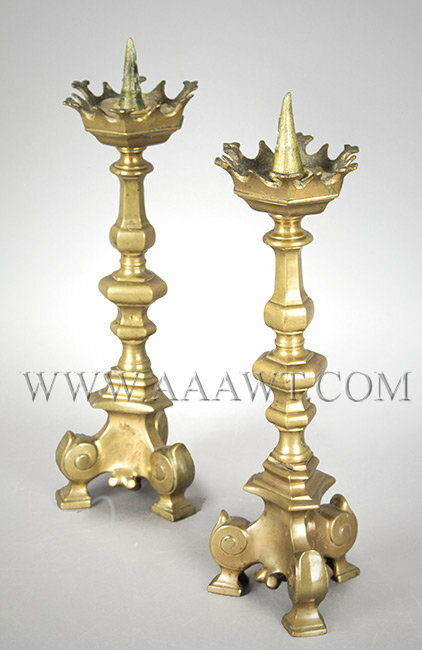 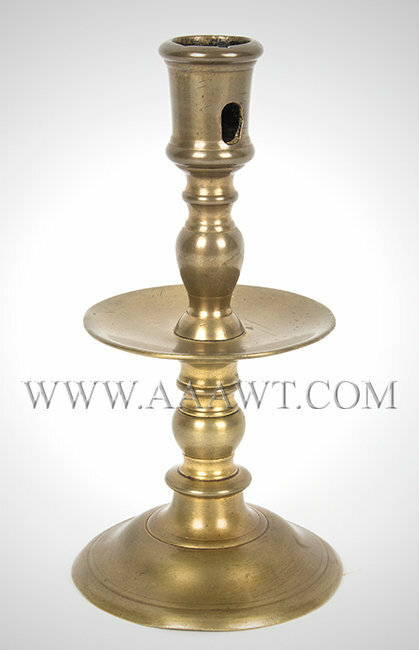 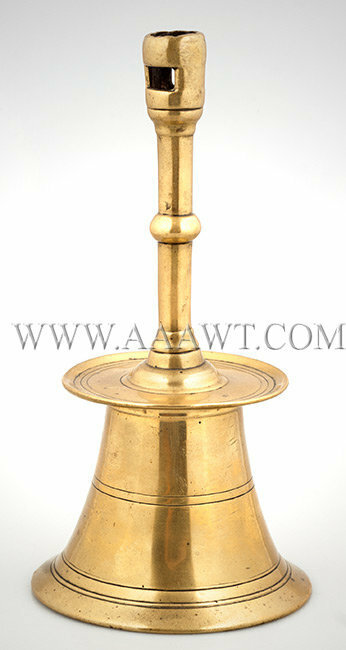 French Louis XIV Brass Candlestick, Baluster Form Stem, Domed Octagonal Base, H: 6.5"
Copper Alloy, H: 12 7/16", Diameter 6 5/16"
Socket with single discoid knop; transitional hollow-cast elongated vase with discoid knop beneath; drip tray features an inclined rim and conical center; lower shaft is interestingly shaped similar to a wassail bowl with pronounced lip. 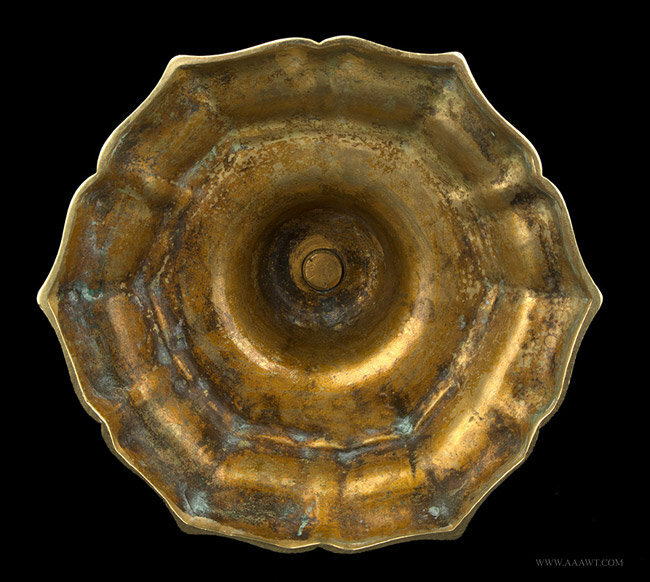 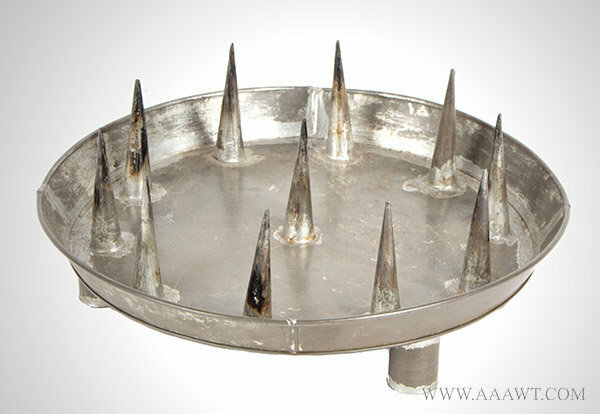 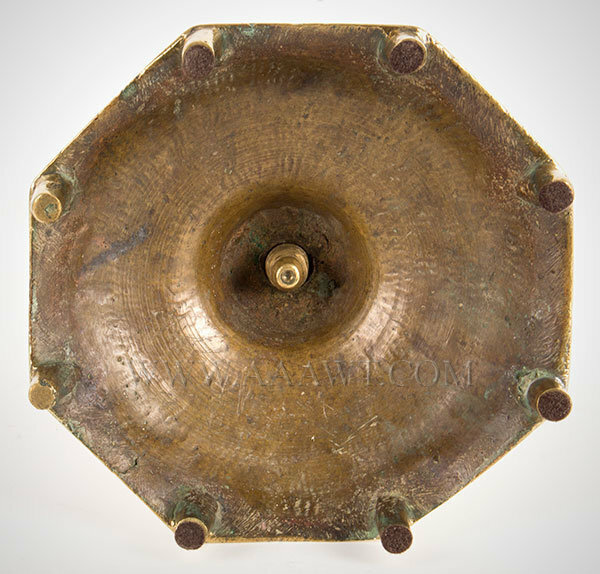 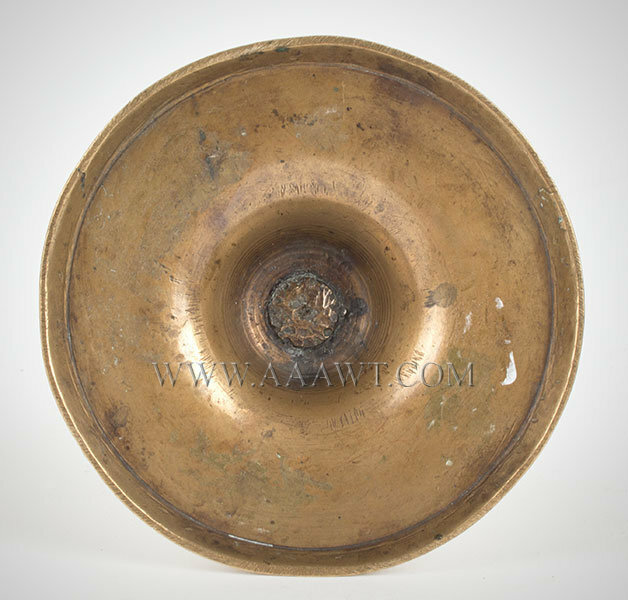 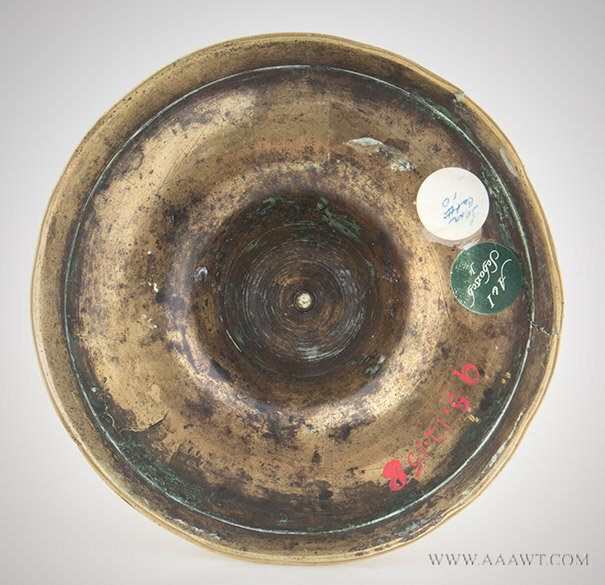 The spreading circular base features a flaring foot beneath the upswept pan and stepped cones. 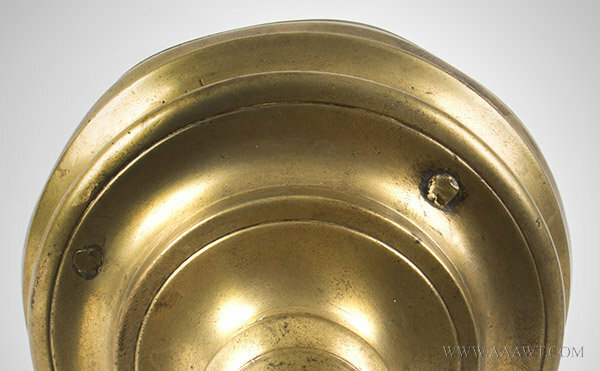 There is a small modern patch to base skirt; drip tray has a break across one-third of the diameter that was long ago repaired with soft solder. 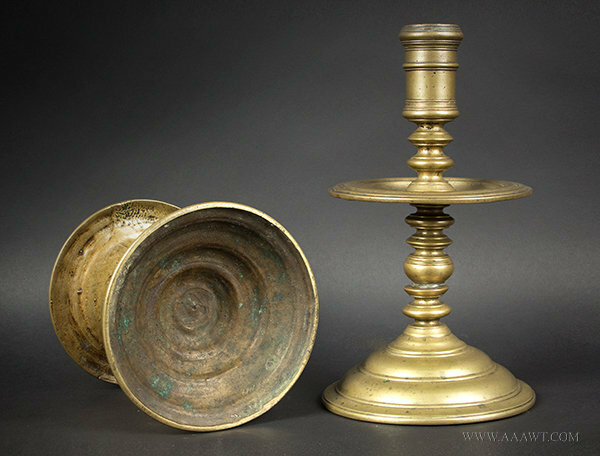 Literature: The Lear Collection, a Study of Copper-Alloy Socket Candlesticks, A.D. 200 - 1700 by Christopher Bangs; number 52, pp., 90 and 246. 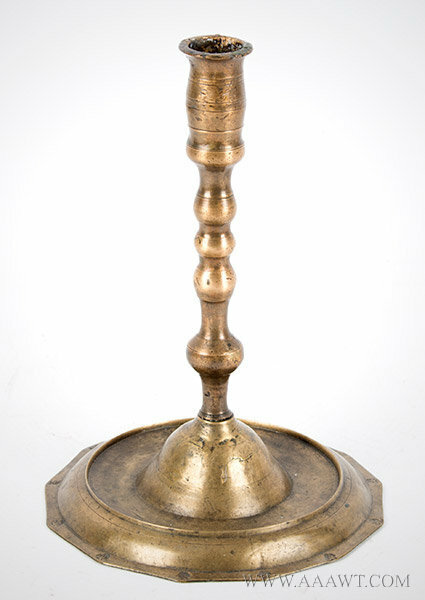 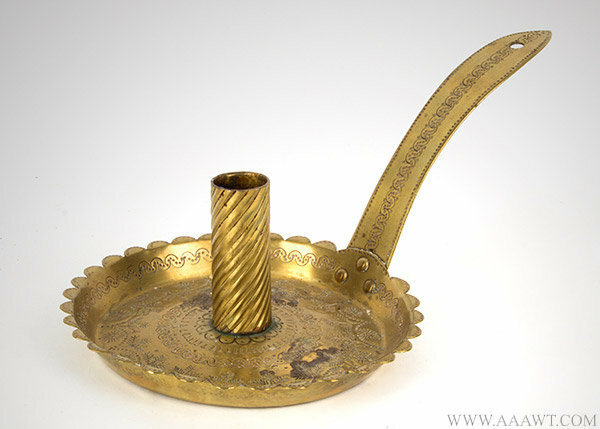 Competently made, canted sides, central pricket centered by 10-prickets raised on three feet with domed bottoms; what was this curios object used for? 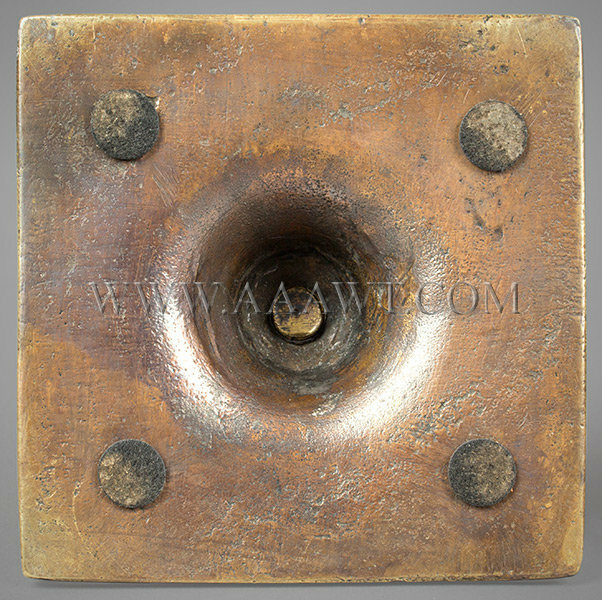 Nozzle with rectangular ejecting aperture, knopped stem stepped at domed center of incised grease pan with flared rim above the flared base containing cast iron clapper. 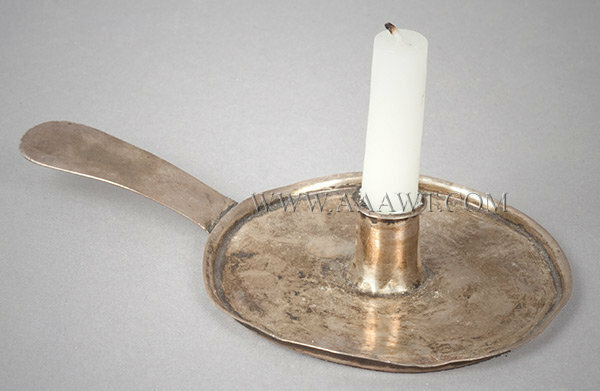 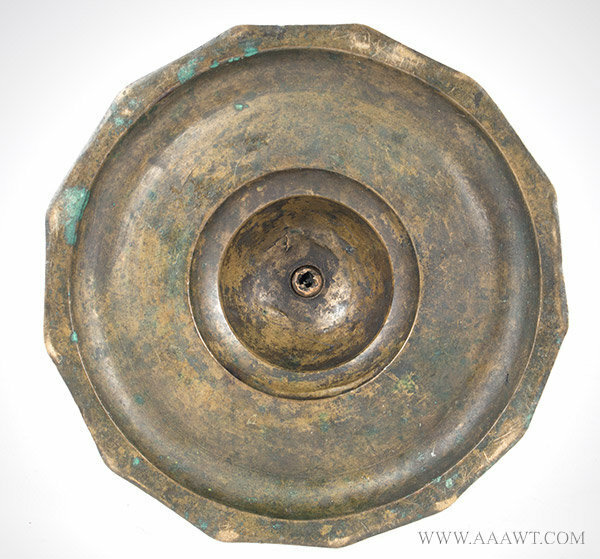 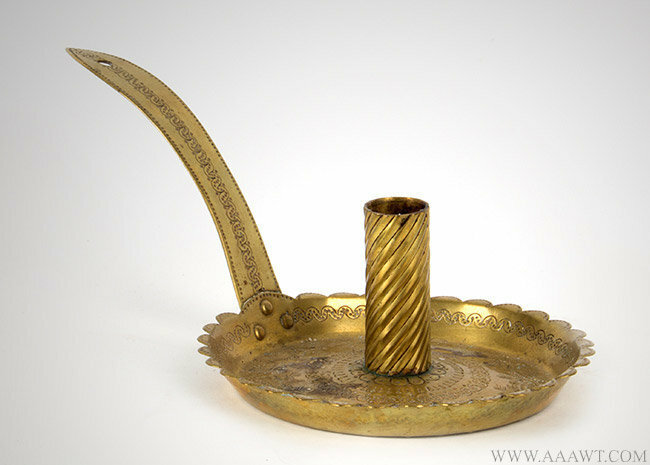 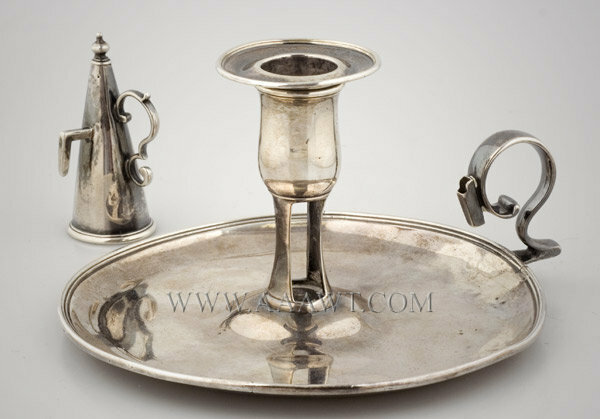 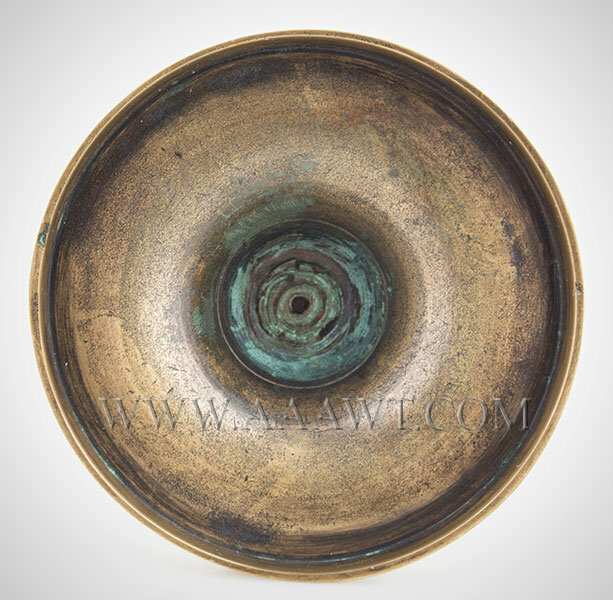 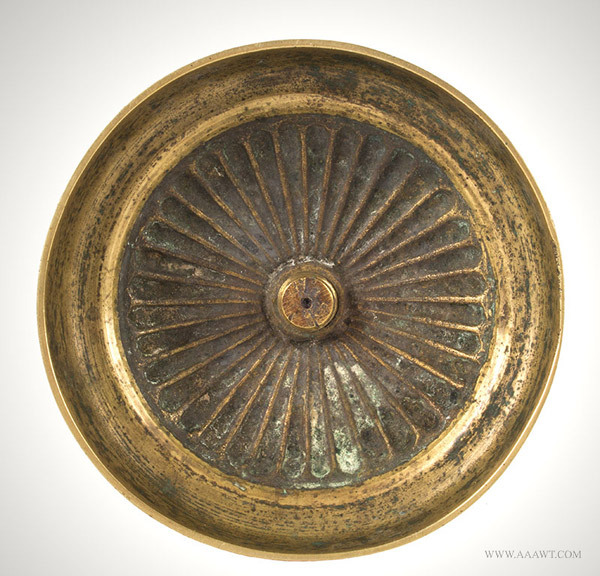 The circular dish is slightly domed and features a raised (dished) molded edge; rising from the center is the 3.5-inch open stem that would have received scissor-form snuffer/trimmer. 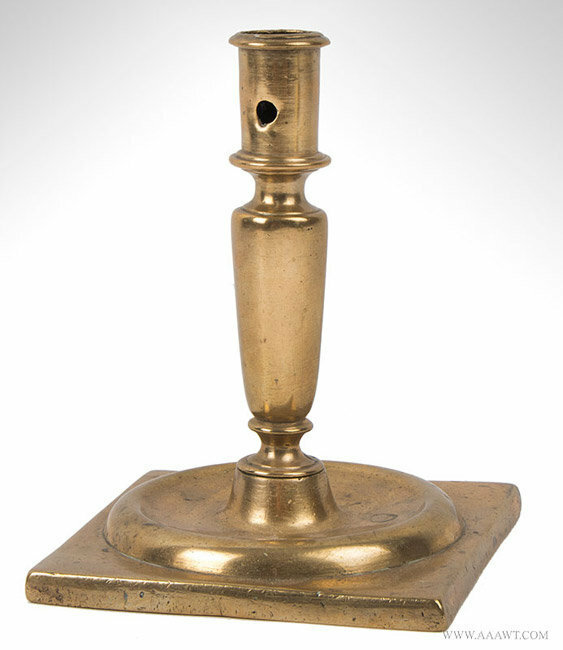 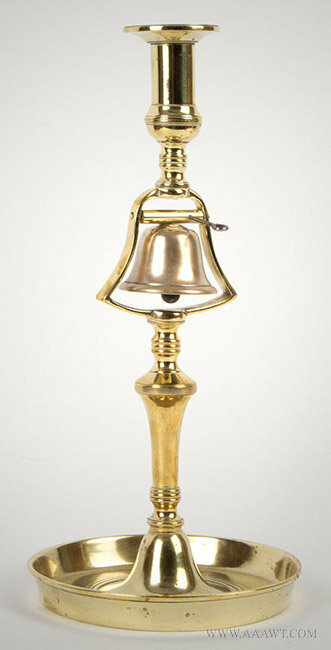 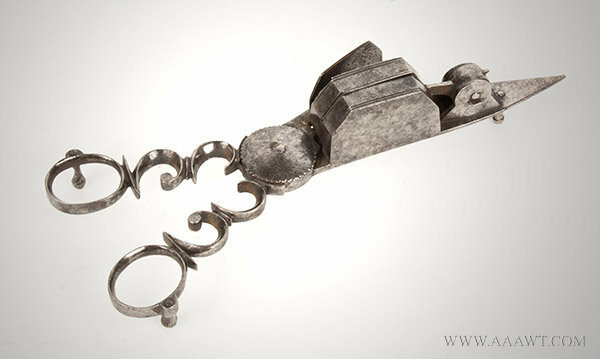 The removable bobeche is signed by maker; scrolled handle is fitted to accommodate the accompanying maker signed snuffer featuring a scrolled handle and knopped finial. 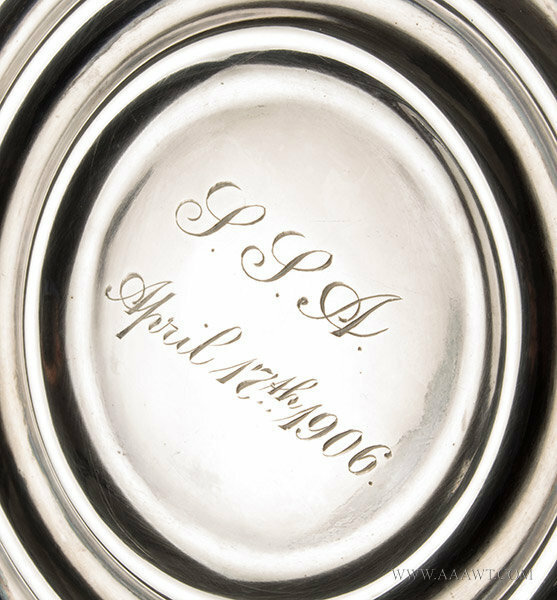 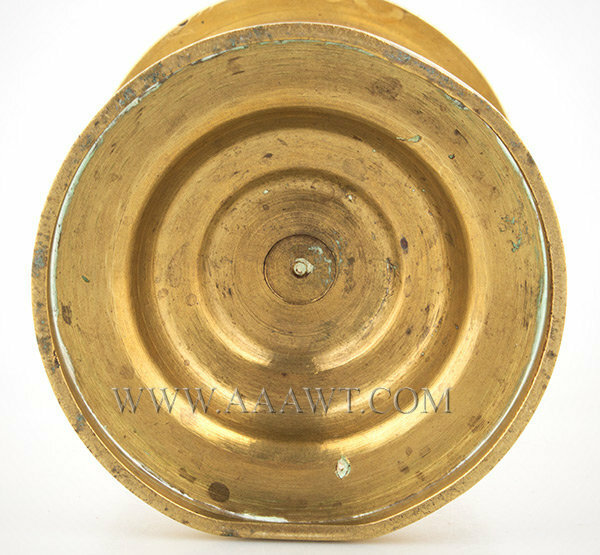 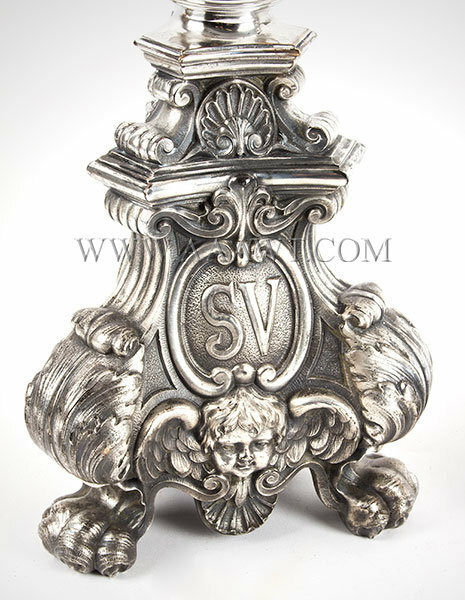 The underside of base is maker signed and engraved with seven names, their ages and dates ranging from 1753 to 1767. 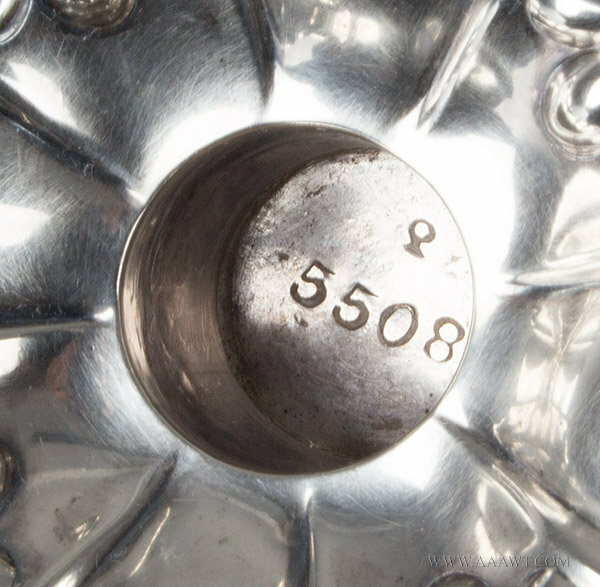 It appears that the rim of dish has been expertly repaired. 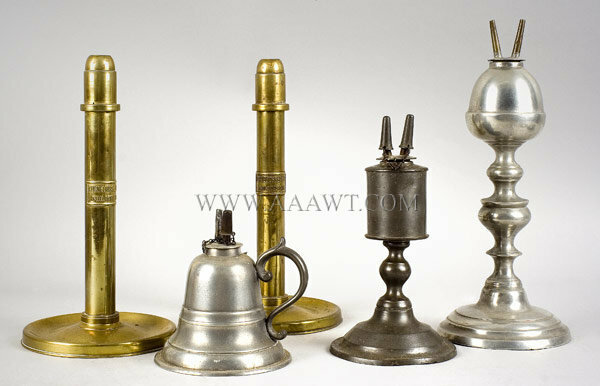 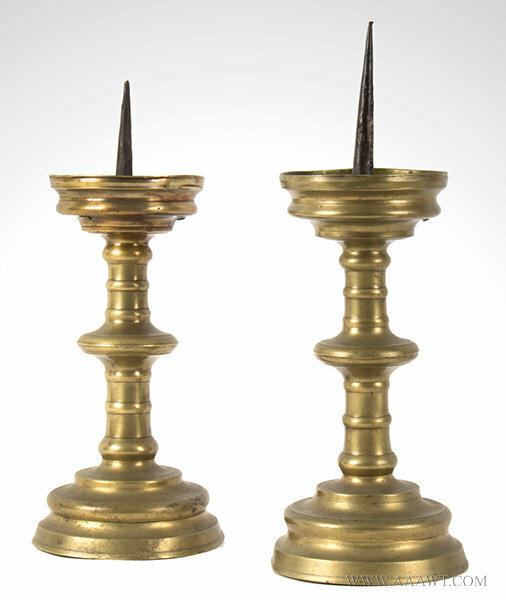 Each with applied relief plate identifying maker; the stems on dished bases retain thimble-springs. 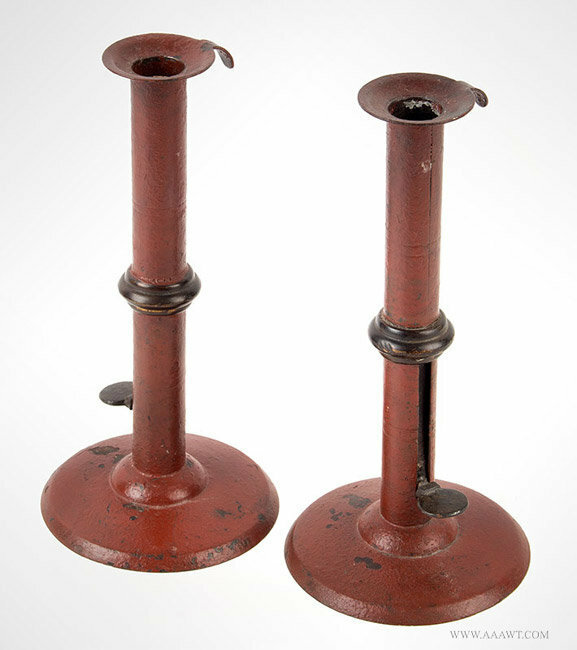 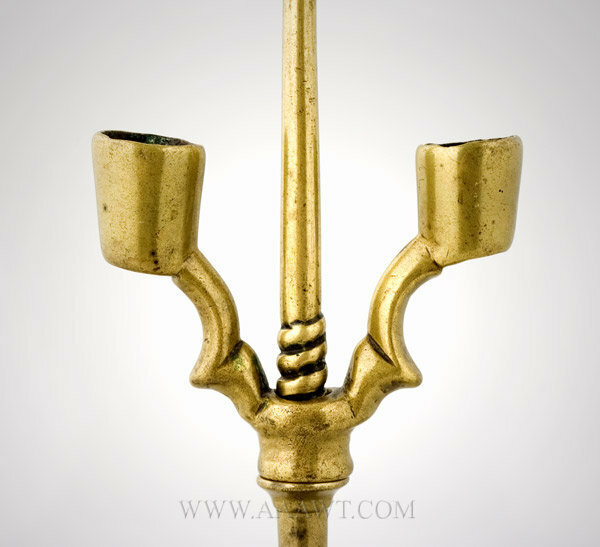 The shaft contains an iron spring that applies constant candle pressure against the removable cap and the candle burns it is advanced causing the flame to burn at a consistent height and preventing the dripping of wax. 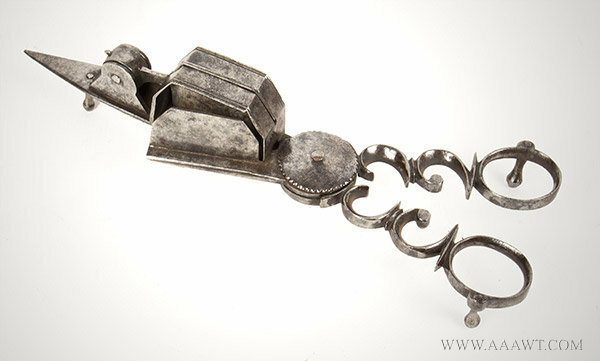 See Metalwork in Early America by Donald Fennimore, page 218. 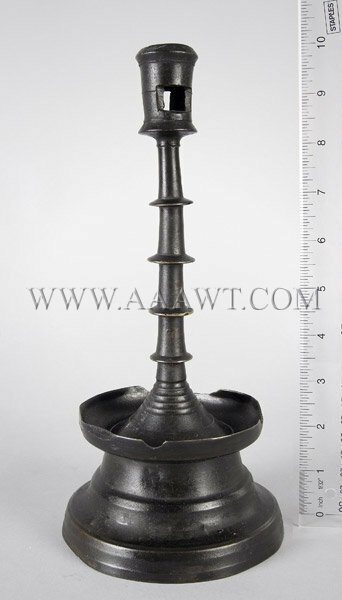 Dimensions: 9.5" H, 5" base diameter. 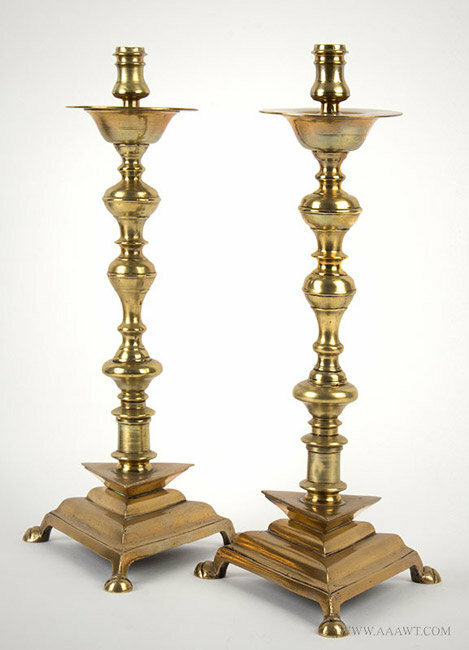 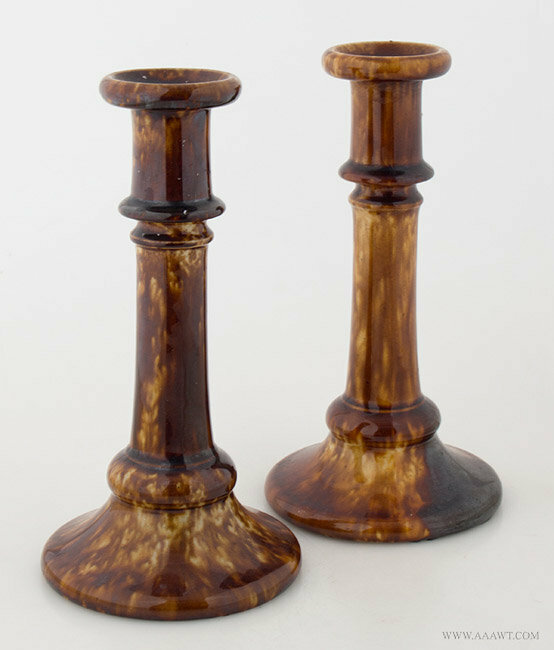 A handsome pair of sticks with deeply indented foot, tall sockets, elegant stem featuring considerable detail, and shaped drip-pans; fine condition. 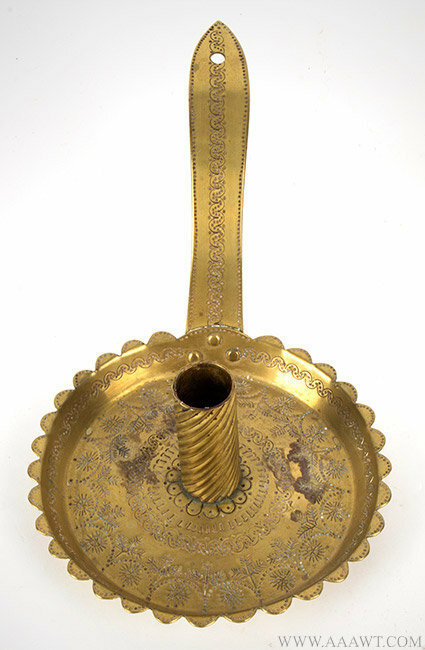 A nearly identical design is featured in an 18th century pattern book owned by Winterthur, see Domestic metalwork 1640 - 1820 by Rupert and Field, page 164, plate 124. 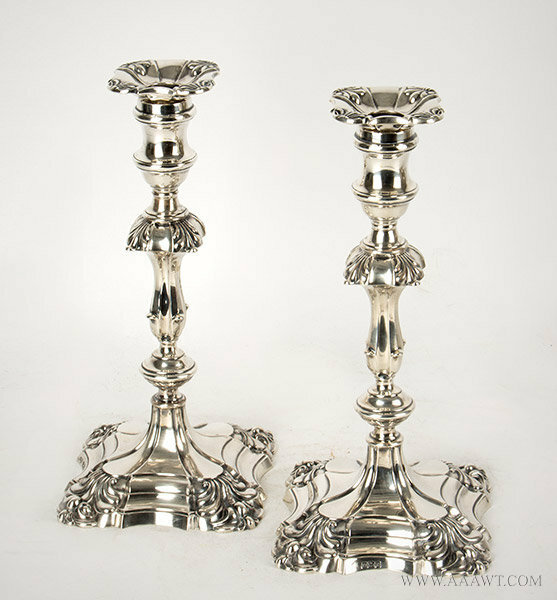 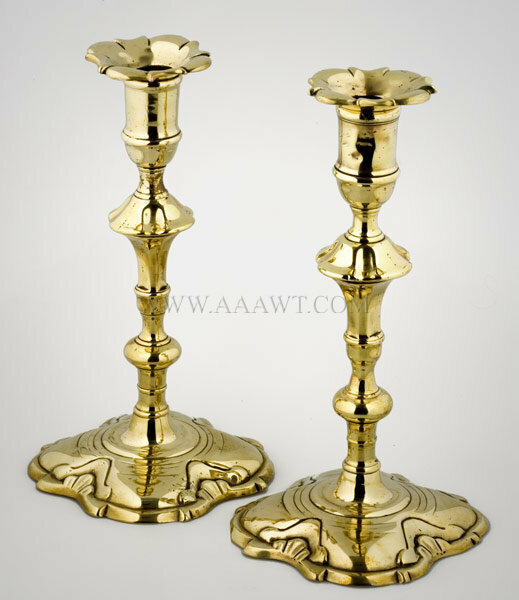 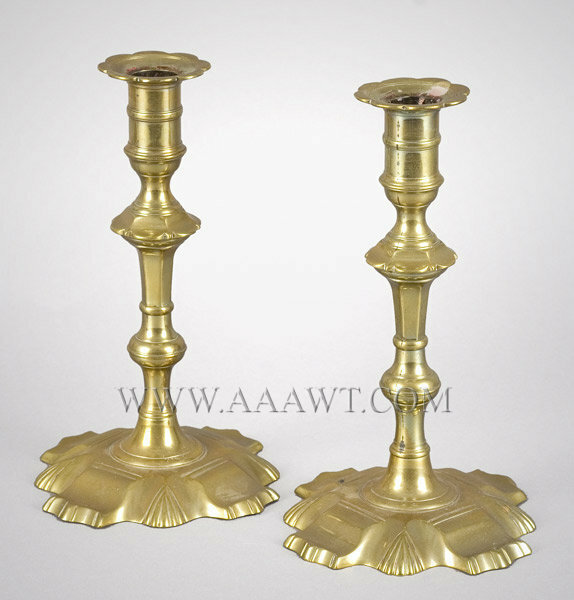 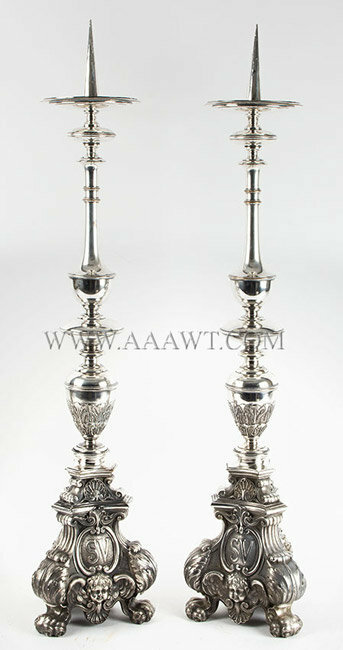 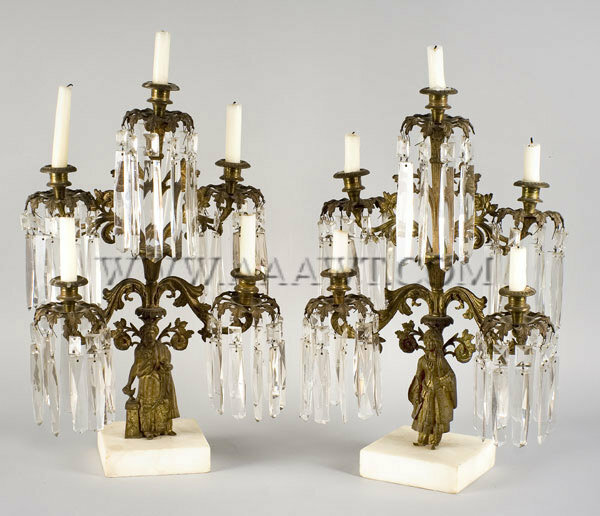 Dimensions: 7.5" H.
A pair garnitures featuring five-light candelabrum; each flared stem/socket above leaf tip drip-pan hung with colorless faceted prisms; scrolled foliate arms raised on floral decorated standard featuring Sultana in exotic costume on marble base.